STUDYING the seabed does not always mean penetrating the sea itself, even if that penetration is done using sound waves rather than submarines (see article). There are a few places where what a geologist would call the ocean floor is actually dry land. One such is the Danakil depression, which lies near the northern vertex of the Afar Triangle, a rift valley stretching from the Dallol volcano in Ethiopia past the salt plains of Lake Assal, in Djibouti, to the north-west tip of Somalia, and then inland to Awash. 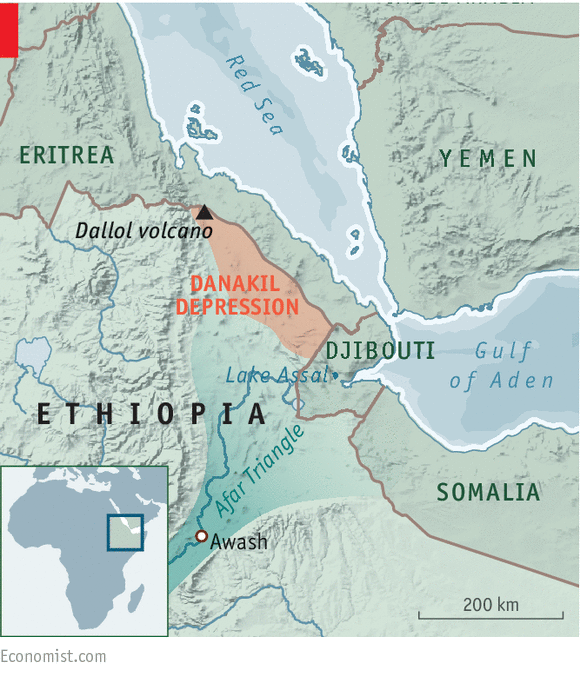 Millions of years ago, the Danakil was indeed covered by the sea—in its case, the Red Sea. But volcanic eruptions formed barriers of lava that isolated it from the ocean. What water remained evaporated in the intense heat, leaving brine lakes and saline flats. These are mined, and the resulting slabs of salt exported by camel, by nomadic Afars who are the nearest thing the depression has to permanent inhabitants. 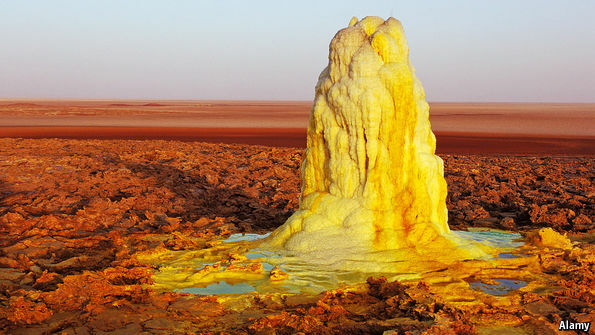 Dallol, appropriately, means disintegration in Afar. For this is a place where Earth’s crust is, indeed, disintegrating. The triangle sits at the convergence of three tectonic plates, which are slowly separating. A glance at the map shows that, were the whole triangle to flood (not possible at the moment, because not all of it is currently below sea level), the African and Arabian coasts would run parallel, as they do farther north along the Red Sea. That sea is an incipient ocean. The continents either side of it are being pushed apart by basaltic eruptions along a line that will, in millions of years’ time, form a mid-ocean ridge. The Danakil is geologically a part of the ocean floor because it is underlain by this erupted basalt, rather than by granitic continental rocks. It is also close enough to the infant ridge to be volcanically active. Rising magma heats the area’s groundwater, which wells up—dissolving salt, potash and other minerals from the rocks it travels through—to emerge as hot springs. The water then evaporates, leaving crusty formations (see picture) coloured both by minerals like iron and copper, and by such algae and bacteria as can survive the salinity. The result, to human eyes, is surreal. It is also scientifically interesting. Many who speculate about life’s origin think hot springs were involved. The dissolved minerals and gases these springs eject provide chemical possibilities for fuelling living creatures that are independent of the photosynthesis which drives modern biology. As a consequence, underwater springs of this sort team with life adapted both to the chemistry and to the temperature. If the speculators’ line of thinking is correct, these “extremophile” organisms may once have dominated life on Earth, but those of them that now live deep in the ocean are hard to collect. In Danakil, collecting them is easy—at least, it is once you have made the journey there to do so. And some have. Earlier this year Felipe Gómez Gómez of the Astrobiology Centre in Madrid led an expedition to the Dallol, and he plans to return in the winter. Just as, in the 19th century, biologists scoured the tropics for new species of animal and plant, so Dr Gómez Gómez is scouring them for microbes. Whether he will find within his discoveries clues to life’s origins on Earth, and thus some indication of the likelihood it has emerged on other planets, too, remains to be seen. In the meantime, it can be said with reasonable confidence that places like Danakil are about as otherworldly to human eyes as it gets.